Why Did we Become an EPVS Member? When you are considering buying home energy products you could receive a quote from the installer stating how well the product will perform, how much it will save you from a reduction in energy bills and how much you will earn from savings and export tariffs. These figures are key to your decision-making process. You take it on trust that you will achieve these savings because the technical jargon is too complicated to understand and all you really digest is the headline figures that you will be saving hundreds of pounds per year, if not thousands. How can you trust the installer is giving you the correct figures and not luring you into a false sense of security where you will agree to the contract by providing you with over-inflated figures which are not achievable? 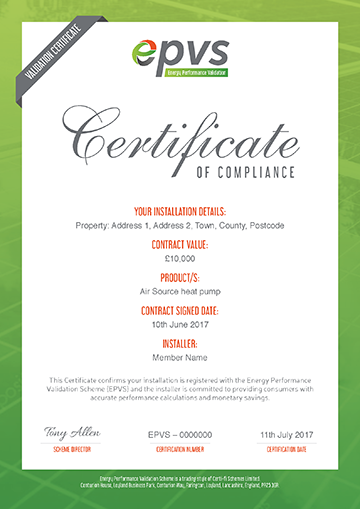 The Energy Performance Validation Scheme (EPVS) is designed to negate this very issue and by using an EPVS member you can feel assured that the installer has gone through a rigorous process to become a member and has satisfied EPVS that its paperwork is up to standard. Our monitoring programme keeps a track of our members to ensure they are providing consumers with accurate performance figures and monetary savings and not over-inflating figures to entice consumers into buying. Increase confidence in the installer providing you with a quote. Added layer of security and protection from EPVS. EPVS process gives accuracy importance thereby reducing misselling. Independent ongoing monitoring of installers ensures compliance. You will receive an EPVS certificate stating your installation is registered. Why risk using anyone else?